They were such a hit, I made another batch a couple of days later and delivered a few more to my friends. I meant to photograph them, but time got the better of me or perhaps it was just that my mouth was stuffed full. The third time, I tried a new shape… various sizes of squares instead of the standard triangle… and while they were just as tasty, the squares didn’t keep their nice edges and just turned into little piles. Great for munching, not so good for the photographer in me. This is the fourth time I’ve made the same recipe, and I finally got around to taking a few shots. For half of the recipe, I decided to experiment a little with a less sweet dessert, flavoring the little biscuits with citron zest and cocoa nibs. The zip of the lemon matched well with the nuttiness of the nibs… topped lightly with some powdered sugar and a swirl of lemon butter for a touch more sweetness. My citron zest came from a Buddha’s hand, but lemon or even orange would be great too. The other half I used dried (and then re-hydrated) blueberries… not as good as fresh, but yummy all the same. Anyway, as I mentioned, what really makes these scones special is the cream. Rather than just adding it into the dry ingredients, first it’s whipped to soft peaks and then gently folded in. This makes for a dough that’s a bit difficult to handle, but with a well floured board and well floured hands, you get the hang of it pretty quickly. And, once you’ve tasted the results, you’ll find that it’s well worth the bit of sticky cleanup. Sift the flour, sugar, baking powder and salt together in a medium to large bowl. Mix in your fruit, nuts or zest. Beat the cream with a whisk or mixer until you get medium soft peaks. Fold half of the cream into the flour mixture, mixing carefully. Try to get all of the flour off the bottom of the bowl. Then, mix in the other half of the whipped cream and fold in very gently. Lightly flour a work surface, and carefully pour the mixture out onto the surface. The dough will probably still be a bit wet, with dry bits of flour here and there. Flour your hands, and carefully shape the dough into a 1 inch thick rectangle. Then, fold the dough in half over itself and flip it over. It should start to become somewhat moldable. If it seems too wet still, sprinkle a touch of flour on the top and shape and fold again. However, don’t do this too many times or you’ll kill the advantage of whipping your cream first. Once it will basically hold together, form a 3×16 rectangle about an inch or so thick. Cut the rectangle into triangles (about 10 to 12). 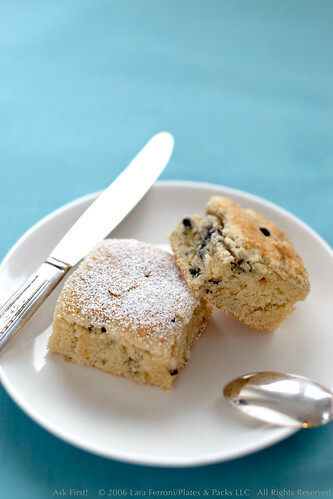 Lift scones and place onto the parchment very close together. They should almost be touching, but not quite… maybe 1/4 or 1/8 of an inch between. This will help them keep their shape. Bake for 20 minutes or until golden brown. Scones should cool for about 15 minutes, then dust with powdered sugar. This entry was posted in Breakfast, Desserts, Food, Recipe, Sweet, Vegetarian. Bookmark the permalink. Although I have a delicious scones recipe that produces soft and pillowy ones, I am will be sure to give yours a try….you had me at heavy cream! As always, your pictures are inspiring. Beautiful beautiful Lara! I will have to rush to that page and give them a try! Love the composition of your first picture, yum yum! Ooh I must try these! I always make scones with cream or yoghurt now, they just turn out fluffier and more moist, which is how I like htem. After searching for cocoa nibs in every grocery store I’ve been in for six months, I finally found cocoa nibs, hooray! I have been looking for recipes in which to use them. These look gorgeous and I can’t wait to try out your recipe. You must must must try these scones – so far when it comes to the macrina cookbook these and the cinnamon rolls are definitely at the top of the list!!! A great recipe, like most of you post. I discovered this corner in English class, and the truth is that I love it. My name is Stephanie, regards.